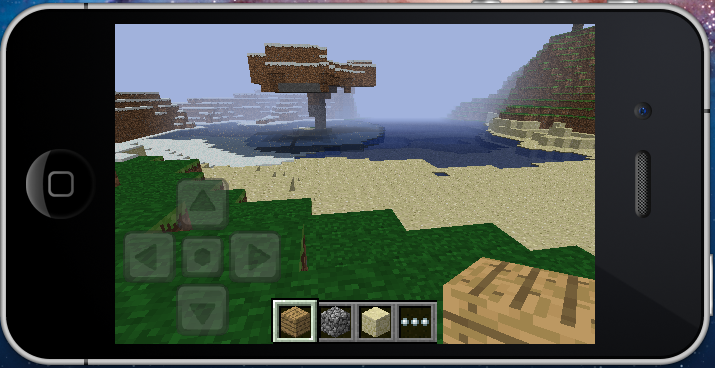 Daniel Kaplan recently revealed a screenshot teaser of the upcoming Minecraft Pocket Edition for iOS! This will give even more players a chance to feed their Minecraft cravings on-the-go. While no set release date has been revealed, the confirmation of an iOS release is nonetheless very exciting news! Until now, Minecraft Pocket Edition has been exclusively for Android handsets, allowing for the indie blockbuster game to reach even more gamers. Where will we see the game go next? Stick around and find out! My mother has a I phone 4...... She can get Minecraft Pocket Edition! Their = Possession There = Place They're = They are. LEARN IT. The one thing we need is an iPad compatible version. The makers of these posts should do their research. It's not Android-only, it came to Xperia PLAY first. Because I happened to find an extra $500 laying around, and I had nothing to do with it and I was like, "Hey! I'm going to get an iPhone!" Can't wait to get it, play it for 10 minutes, then go back to PC and never use it again. The Xperia Play is an Android phone. It was just not initally released with touch screen ctonrols, thus locking it to the Xperia Play's digital pads. apparently I can not finish my sentences while in excited mode. I don't really know how to make a signature. Location: Sitting at my computer, duh.